The adjustable height and length steel workbench frame allows you to modify the workbench to match your needs. The heavy-duty 18 gauge steel allows a weight capacity of 750 pounds. A work surface is not included select your own 4 ft., 5 ft., or 6 ft. by 24 inch work surface. The frame height is adjustable in 1 inch increments between 29 inch -41 inch and the frame measures 18 inch deep. Compact Reloading Bench is Great for the Weekend Warrior. Work surface is 1" thick and fastens directly to the steel end panels and top rails for greater stability. Rugged steel I-beam constructed end panels provide added strength. 2 large steel shelves help organize your work area. Shelf size is 17" deep x 38" wide. Steel pegboard end panels provide hanging storage for additional tools and supplies. Assembles in minutes. Fastening hardware included. Adjustable Height and Length Workbench The adjustable height and length steel workbench frame allows you to modify the workbench to match your needs. The heavy-duty 18 gauge steel allows a weight capacity of 750 pounds. A work surface is not included select your own 4 ft., 5 ft., or 6 ft. by 24 inch work surface. The frame height is adjustable in 1 inch increments between 29 inch -41 inch and the frame measures 18 inch deep. 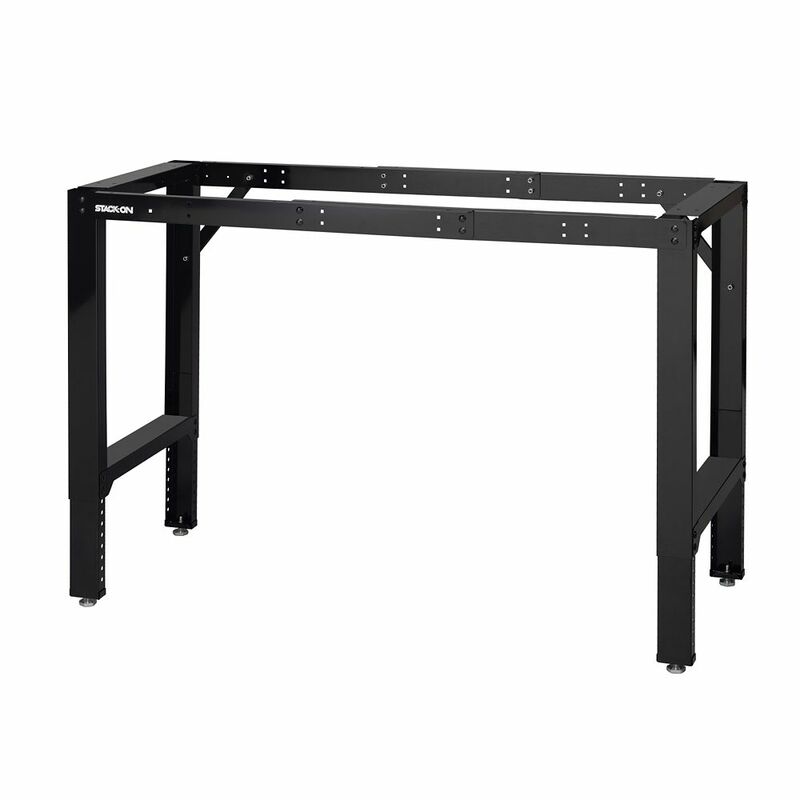 Adjustable Height and Length Workbench is rated 3.0 out of 5 by 2.